On Sunday, it could be the final time that we see the Alan Johnson Racing Top Fuel dragster driven by Shawn Langdon. The former World Champion driver told The Capital Sports Report that their season would be over following the Toyota NHRA Summernationals in Englishtown two weeks ago, but they completed the Eastern Swing the past two weekends. “It’s very tough to find something,” Langdon said. “In this day in age, you properly need $3 to $4 million to run a team like this. In order to do that, you need to work with a major sponsor, and a lot of their budgets are already set. Alan Johnson and Langdon has had Toyota step up to get the team through its first 11 events of the season. In recent weeks, the team has been sporting Bass Pro Shops on the dragster. When Al-Anabi Racing left as the team’s sponsors several months ago, it put the team in a scramble to find a new sponsor, which is still going on to this day. Celebrity Guy Fieri’s Knuckle Sandwich stepped up for the first few races, as the sponsor on the car, and the brand is still on the team’s haulers. “It’s been a tough year since January 1st,” Langdon added. “Losing a major sponsorship with Al-Anabi Racing pulling out has set us back quite a bit. That happened right before we were going to go testing. When you start off the year with that kind of news, you must go in survival mood. Luckily, Guy Fieri has stepped up with his Knuckle Sandwich brand, while also becoming part of our team. The team had special guests this weekend at the NHRA Thunder Valley Nationals at Bristol Dragway in Bristol, Tenn. The guests were a couple, who wrote Johnson a letter and sent him a check for $5 after they heard the team lost its major sponsorship. The NHRA’s next race is at Summit Motorsports Park in Norwalk, Ohio. However, it won’t be known until race week if the team will be racing there next, even though they are currently on the entry list. If the team is done for the season, Langdon will be without a job. Yet, he still plans on racing. “It’s not what I want, but the team that we have with Brian Husen as crew chief, it’s a top-notch team,” Langdon mentioned. “That’s the thing that I don’t want to see go away, because it’s a championship-caliber team if we have the funding to make the run for the championship. We have to be out here racing to do that. 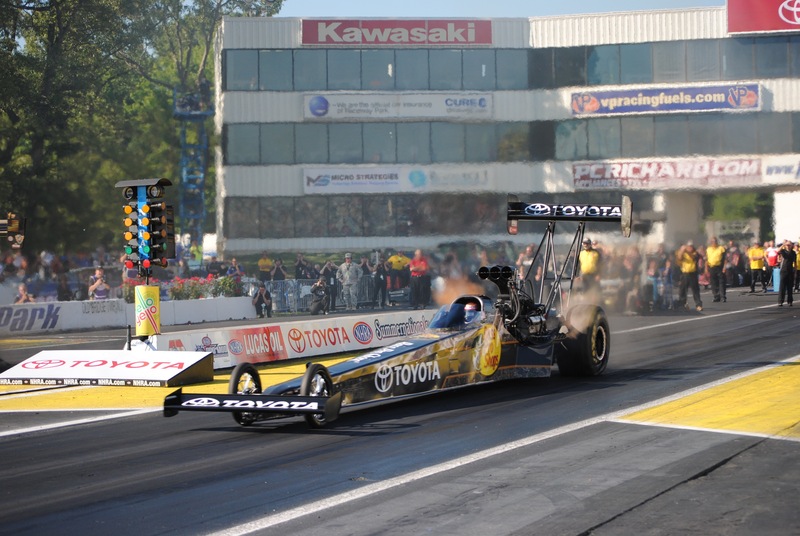 On Sunday, the team went to the second round, before losing to Richie Crampton, who would go on to win his fifth Top Fuel wally in the past two years. The second round appearance was their first since the Toyota NHRA Summernationals, where they lost to Dave Connolly, who made it to the semi-finals at that race. Langdon has made it to two semi-finals this season, but none since the first three races of the year. Those came at Phoenix and Gainesville, before losing to Doug Kalitta in Arizona and Tony Schumacher in Florida. The team, which Langdon believes in a championship-caliber team hasn’t won a race since Pomona 1. At the opening race of the year, the team went on to defeat Antron Brown with a 3.799 to a 3.804 to take home the first wally of the season. Currently, Langdon is in the Top 10 in points. If the team doesn’t race anymore, then he’ll fall out of that position. Also, the team has been forced to lose several members since the news came down months ago. After going from a two car team that also featured Khalid alBalooshi, the team lost crew members at the end of last season and lost crew chief Jason McCulloch to Bob Vandergriff Racing after a few races. “There were a few guys that left at the end of last season from my team that went on to work for IndyCar teams, or to stay local to be with their families,” Langdon stated. “We had to mix some guys to fill the teams – then when we found out the news – we had like 15 qualified crew guys and only had eight spots available. It was a very tough decision made, as we had to go our separate ways with some guys, and we had to do with what we had to do in order to keep our guys out there.